During the last week of January, Cirenas had the pleasant surprise of hosting Guayaki Yerba Mate’s annual Directors for a 5 day corporate retreat. Every year the owners of Guayaki Yerba Mate, Alex and David choose a different location around the globe to review with their representatives of Brazil, Paraguay and Argentina the year’s accomplishments and future goals. Alex and David were staying in Santa Teresa with their families during the holiday season and by chance heard about Cirenas. Within 11 days of a first introduction and a proposal from us, with a beautiful itinerary including meeting spaces, times and fun activities, the Directors arrived to Cirenas from the three South American countries. From day one, everyone was fascinated with the remoteness and beauty of Cirenas, as well as the undivided attention from all employees. All participants were picked up at the local airport by Cirenas’ transport representatives, who are also great guides and story-tellers of the area. Not long after arriving to Cirenas, the majority opted for a sunset swim before dinner. Day two, was a day to visit the neighboring organic farm, Rancho Cenizaro. As all members of Guayaki Yerba Mate are great agriculturists, they were fascinated with Carlos’ tour and presentations. Again, a sunset swim was a must prior to dinner. Day three, was an all-day meeting in the Cirenas classroom, filled with presentations from each country’s director and their team. Many interesting conversations resulted from the gatherings. Fruit, snacks and natural fruit juices were always available during meeting times. Again, day 3 ended with a breathtaking sunset while swimming at Playa Ario. On day four, the last day at Cirenas, Sam Kenworthy, Cirenas’ permaculture guru gave a campus tour to all 14 participants. 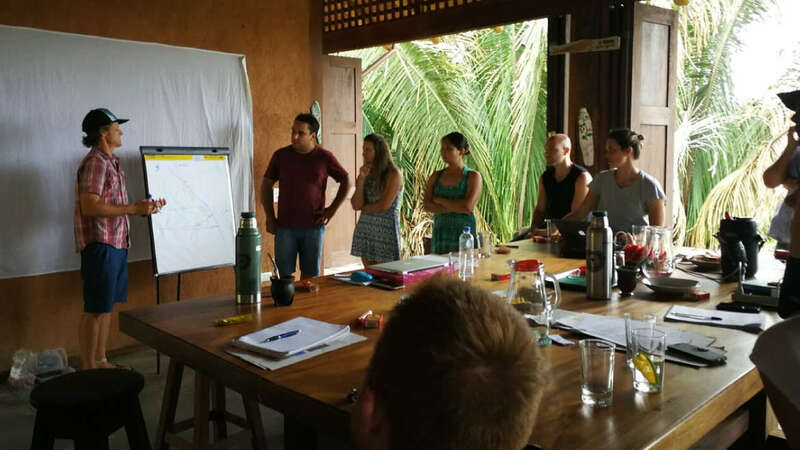 The groups of Brazilians, Argentines and from Paraguay were all fascinated with Sam’s knowledge, passion for permaculture and educational abilities. After lunch, a 2 hour horse tour was organized for everyone by Veronica. She also set up a wonderfully catered barbecue with huge bonfires, live music and a long table for all 14 to sit at on the hill-top of beautiful pastures overlooking the ocean and blanketed by stars when it got dark. It was a spectacular evening for a fantastic group of friends and colleagues who share one special night, once every year.